TORONTO — For Blue Bombers general manager Kyle Walters, there was no better fit at No. 1 overall. 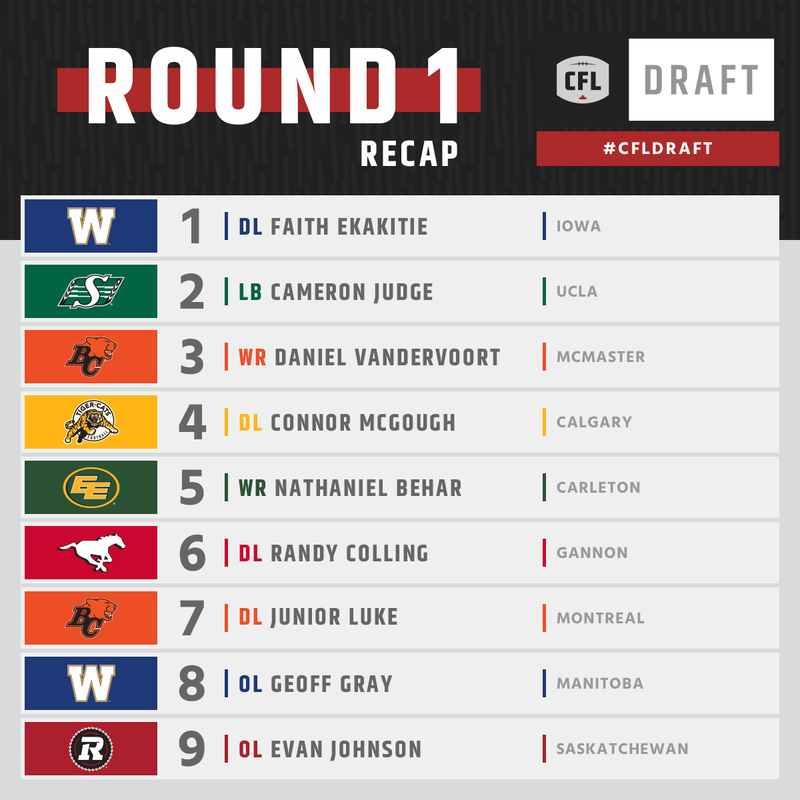 Iowa defensive tackle Faith Ekakitie was the first prospect off the board on Sunday night, launching what would soon become an eventful and unpredictable 2017 CFL Draft. By the end of the draft, 71 players were selected at the CFL Draft while 56 U Sports players were selected from 20 different schools. All eyes were on the Bombers heading into Sunday night and Bombers fans shouldn’t be disappointed. In addition to Ekakitie, Walters also landed highly-touted offensive lineman Geoff Gray out of Manitoba in the first round and McGill offensive lineman Qadr Spooner in Round 2. Those results are hardly a surprise based on pre-draft prognostications. The same could not be said for the rest of the draft. The Riders followed the first overall selection by taking recent addition to the draft board and UCLA linebacker Cameron Judge. While highly-touted receivers Danny Vandervoort (BC, 3rd overall) and Nate Behar (Edmonton, 5th overall) also went off the board early, it wasn’t until the eighth overall pick that an offensive lineman was selected in Gray. That selection, which the Bombers made after trading down two spots with the Calgary Stampeders, isn’t without risk after Gray signed an priority free agent deal south of the border with the Green Bay Packers. Eleven of the last 17 first round picks were offensive linemen heading into Sunday night but in this year’s edition of the draft, only two O-linemen were taken in the first nine picks. 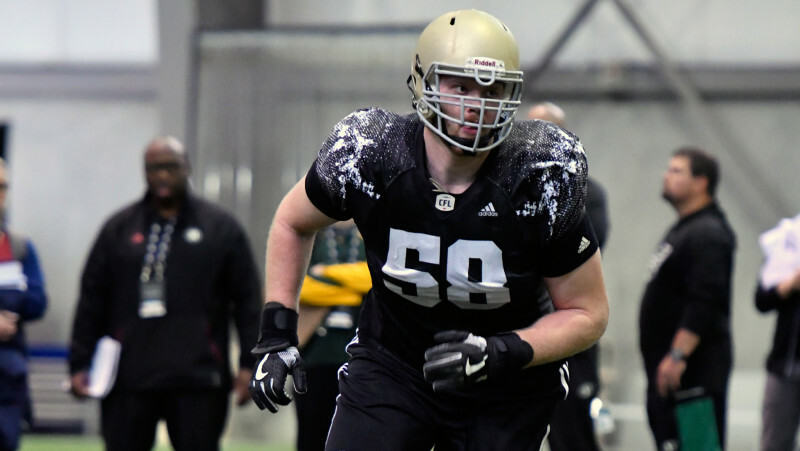 The run of big men truly kicked off in the second round when six of nine selections were offensive linemen including Mason Woods (Toronto, 10th overall) and Dariusz Bladek (Saskatchewan, 11th overall). The selection of Woods marked the first by Jim Popp as the general manager of the Toronto Argonauts. Some value may have come in the third round, starting with the Alouettes’ selection of Dondre Wright with the 20th overall pick. The Eskimos took Maine linebacker Chris Mulumba 22nd overall while the REDBLACKS closed out the third round with UCLA defensive tackle Eli Ankou. 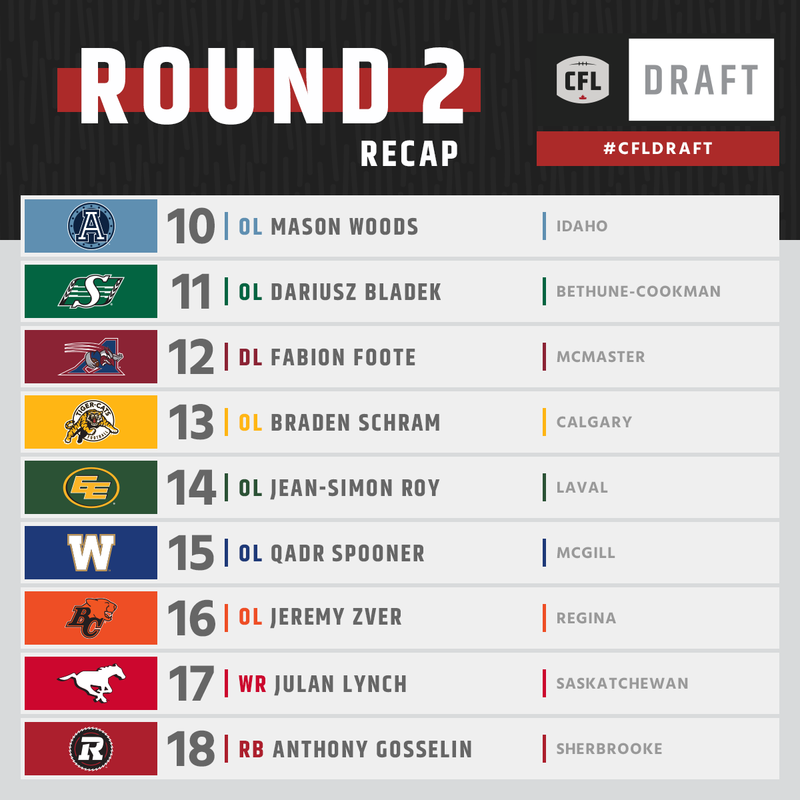 Two of the draft’s highly-touted defensive backs highlighted the fourth round, starting with the Argos’ selection of Calgary defensive back Robert Woodson 27th overall followed by Waterloo’s Jordan Hoover going to the Eskimos at 31. Antony Auclair, a tight end out of Laval and one of the draft’s most intriguing prospects, also went in the fourth round, 30th overall to the Saskatchewan Roughriders. The Riders went local in the fifth round with Regina receiver Mitchell Picton while, three picks later, the Eskimos took recent NFL sixth round draft pick and top-ranked prospect in the CFL Scouting Bureau Justin Senior. In one of the biggest surprises of the draft, Guelph running back Johnny Augustine wasn’t selected through eight rounds of the draft. He was the 17th-ranked player in the CFL Scouting Bureau in April after a strong showing at the CFL Combine presented by adidas.